his map labels the NDCC study area. The North Denver Cornerstone Collaborative (NDCC) area consists of all or portions of the Globeville, Elyria-Swansea, Cole, Clayton, and Five Points neighborhoods, totaling 4,600 acres or seven square miles. These neighborhoods have a rich history of making fundamental contributions to the city. Recently, these neighborhoods have been experiencing rapid growth and development. There are currently 25,000 existing residents with 50,000 additional residents expected to move there by 2040. 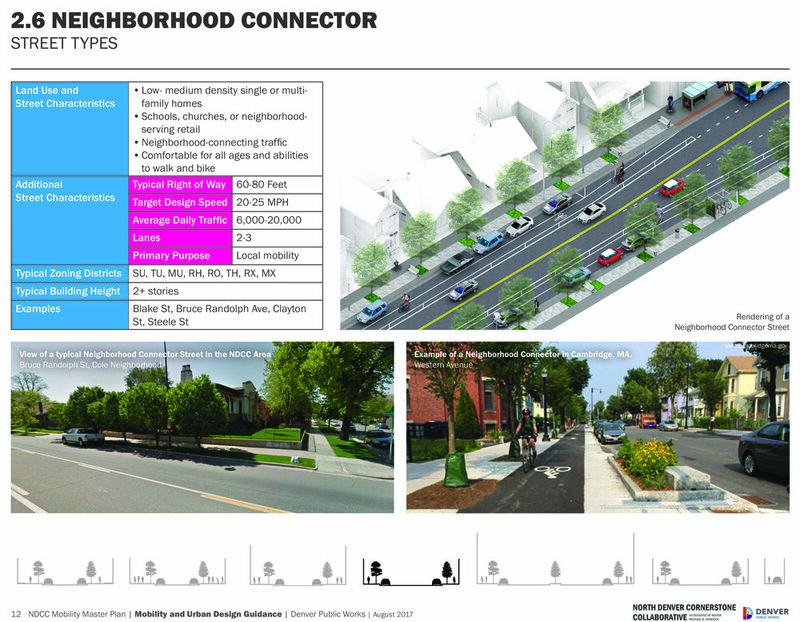 As part of the NDCC effort, the City and County of Denver created the Mobility Master Plan in March 2016 that was led by HDR, Inc. The plan included developing layered multimodal transportation networks within these complex and historic neighborhoods to make travel easier and more convenient for people walking, biking, and taking transit. The HDR team had to identify key missing or challenging transportation connections and develop innovative solutions that would address not only the NDCC efforts with the city, but also the needs of each unique community within the project area. In doing so, the team used four overall measures to assess potential projects effectively: mobility and access, sustainability and livability, safety, and economic development. At the same time, a new mobility framework had to be established while ensuring that the recommendations will fit within existing standards and processes with the city. HDR had to think outside of the box given the complexities that already existed in the area. The neighborhoods are crisscrossed by two major interstates, I-25 and I-70, with numerous railroad tracks throughout. A geographic information system (GIS) was used by the HDR team to understand barriers in the neighborhoods and identify new connections across them. HDR specifically looked to prioritize projects that increased person-trip capacity through the network rather than vehicle-trip capacity. This put an extra emphasis on projects that help build the low-stress bicycle network in the area, complete the sidewalk network, and create safe connections to existing transit in the area. The heart of the plan is a prioritized list of more than 100 multimodal transportation projects for implementation over the next five to 10 years. This includes a mobility and urban design guidance document that outlines the preferred cross-sections and urban design elements the city and community would like to see in new development projects throughout the area. For more information on the NDCC Mobility Master Plan, visit the project website. 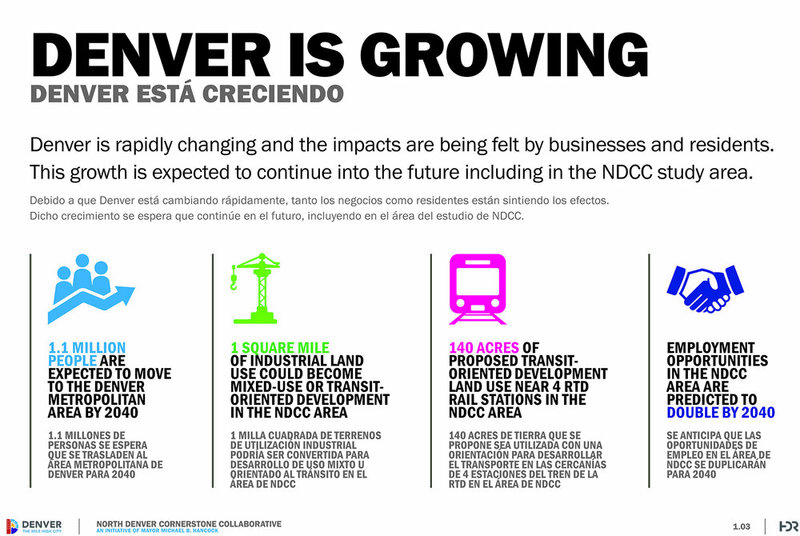 The NDCC was created in 2013 by Denver Mayor Michael B. Hancock to take a new approach to aligning six major projects in North Denver: Brighton Boulevard improvements; Interstate 70 expansion; National Western Center expansion; neighborhood plans for Globeville, Elyria and Swansea; River North improvements and RTD station developments. Drew Parker is an HDR transportation planner based in Denver with experience in neighborhood transportation planning, multimodal roadway planning and facility design and pedestrian and bicycle safety analyses. Drew takes a collaborative and inclusive approach to transportation planning by empowering people and building capacity and understanding.